MOSCOW - Vladimir Kryuchkov, the former KGB chief who spearheaded a failed coup against Soviet leader Mikhail Gorbachev, has died. He was 83. Mr. Kryuchkov died Friday in Moscow of an unspecified illness, according to the Federal Security Service, the main KGB successor agency. Mr. Kryuchkov owed his swift career rise to Soviet leader Yuri Andropov. In 1956, he worked alongside Andropov, then Soviet ambassador to Hungary, to help brutally suppress an anti-Communist uprising in Budapest. When Andropov became KGB chief in 1967, he took Mr. Kryuchkov along and helped him rise through the ranks. 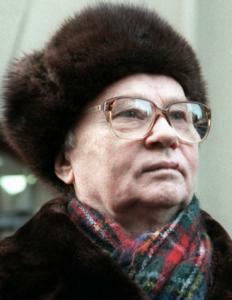 In 1974, Mr. Kryuchkov was named chief of the KGB's First Main Directorate in charge of spying abroad. Mr. Kryuchkov was appointed chairman of the KGB in 1988 by Gorbachev, who later said he had originally thought that Mr. Kryuchkov had less extreme views than some of his colleagues. As Gorbachev pursued changes that led to the loosening of political and economic strictures that had been a hallmark of Soviet rule, Mr. Kryuchkov became an increasingly strident spokesman for those who contended that the country was veering toward chaos. In the months before the failed coup, Mr. Kryuchkov made a televised statement, warning that "the threat of the collapse of the Soviet Union has emerged." He later publicly assailed Gorbachev for seeking aid through Western programs, saying they were CIA fronts intended to sabotage the Soviet economy. On Aug. 19, 1991, Gorbachev was removed from power while he was on vacation in the south by a group called the State Committee for the State of Emergency, whose members included Mr. Kryuchkov and the defense minister, Dmitri T. Yazov. Assuming control over the nation, the committee said in a statement that "a mortal danger had come to loom large" because Gorbachev's efforts at reform had turned down a "blind alley." The committee tried to impose strict controls over independent media and public meetings, but Boris N. Yeltsin, who at the time was president of the Russian federated republic, quickly mustered public support for Gorbachev. Yeltsin climbed aboard a tank and appealed to troops not to attack their own people. The coup collapsed after three days and helped precipitate the collapse of the Soviet Union in December 1991. Mr. Kryuchkov and other coup plotters were jailed but later freed on an amnesty. After Vladimir Putin, a 16-year KGB veteran, was elected president in 2000, he repeatedly invited Mr. Kryuchkov and other veterans to Kremlin events. Mr. Kryuchkov had taken a higher public profile in recent years, giving numerous interviews praising Putin and accusing the West of plots to weaken Russia. He also published his memoirs. Last month, Mr. Kryuchkov warned of "big trouble" if a turf battle among Russia's security agencies continues to fester. He and other KGB veterans called on the feuding forces to unite behind Putin for the country's sake. Mr. Kryuchkov's funeral is planned for today. There was no immediate word on survivors.